LT BUCK$ are rewards that can be earned and stored in your myLT account to use on all services and select products in the LT BUCK$ store or in The Life Time Health Store. To check your balance or redeem your LT BUCK$, simply log in to your myLT account. Have friends tell an Account Manager your name during sign-up, and LT BUCK$ will be added to your account. Watch for emails about special promotions, events and contests where you can earn LT BUCK$. Using LT BUCK$ is just as easy as earning them. With a huge variety of products and services to choose from, everything you need to live a healthy way of life is here. Pay with LT BUCK$ in the LifeSpa. Choose from hair care, massage, nail care and more services. 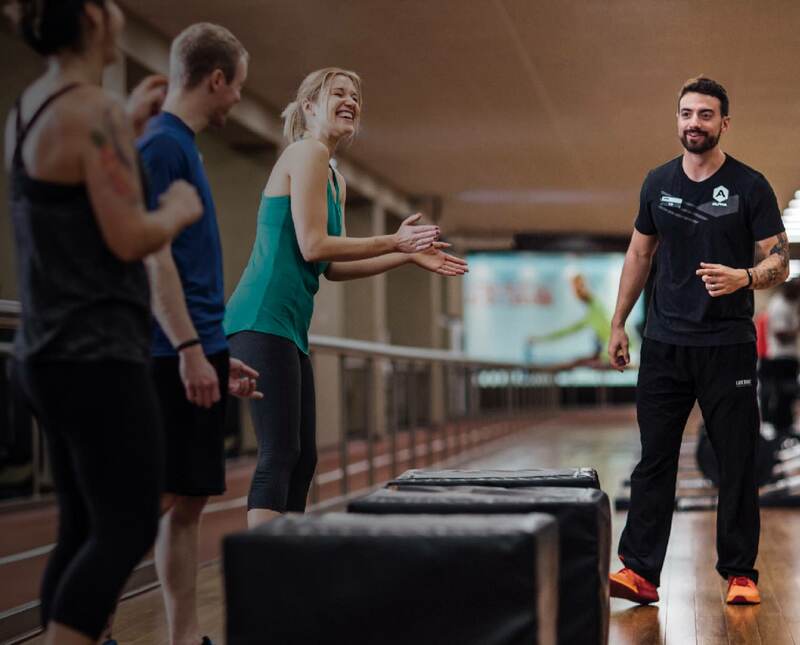 From losing weight or enhancing performance to simply living healthier, our trainers can help make your goals a reality. Receive personalized coaching on how to eat for your goals, develop healthy habits and be held accountable. Get long and lean by concentrating on your core muscles. Improve strength, posture and balance. For kids just learning to swim, or athletic performance, Life Time Swim makes it easy to get started. Choose from Academy classes, camps, birthday parties, Parents Night Out and more. From quiet meditation to a pulse-quickening flow, Life Time offers several varieties of yoga that meet you wherever you’re at. Improve your game while having a blast on the courts, or learn with a progressive system of instruction and coaching. Shop for dietary supplements, energy drinks, protein powders, vitamins and more. Life Time-branded apparel, accessories, duffel bags and more. Shop for equipment that’ll enhance the way you exercise, including yoga mats, foam rollers, TRX trainers, sport bags and more. How do I access my LT BUCK$? LT BUCK$ are added to your LT BUCK$ account upon earning rewards. In some cases, only the primary member will be awarded LT BUCK$. Log in to view your account at myLT.com/ltbucks. LT BUCK$ may be used toward any Life Time services in the LT BUCK$ store. LT BUCK$ can also be used on select products and services in the Life Time Health Store. If you’re having trouble logging in, follow the instructions on myLT.com/ltbucks to retrieve your username or reset your password. LT BUCK$ expire 120 days from date awarded for U.S. members and expire upon membership termination for Canadian members. If you don’t have enough LT BUCK$ to pay for your item or service, you can choose to pay the remainder of your order with a credit card in both the LT BUCK$ store and Life Time Health store. If it’s before the expiration date, you can cancel services from your LT BUCK$ account. When you cancel a service, your LT BUCK$ will automatically be refunded to your account with their original expiration date. LT BUCK$ can be transferred to any other member on your membership. Visit or call Member Services in your club for assistance. Life Time offers the LT BUCK$ program (“Program”) in its sole discretion and may modify, add or delete any of the Program benefits, available products or services, award amounts, redemption or expiration requirements, or terms or conditions, at any time and without notice to you, including terminating the Program itself, even though these changes may affect your ability to accumulate or use LT BUCK$. Changed or updated terms and conditions are effective when posted on myLT.com. Your membership must be in good standing to earn and use LT BUCK$. LT BUCK$ have no cash value and cash will not be paid for any unused LT BUCK$. LT BUCK$ are nontransferable and cannot be combined with other discounts or offers. LT BUCK$ immediately expire upon membership termination for any reason. Life Time reserves the right to revoke any award of LT BUCK$ in its sole discretion, including for any suspected fraudulent activity or your use of the Program inconsistent with these terms and conditions or any federal, state or local laws, statutes or ordinances. Any questions or disputes regarding the Program shall be decided by Life Time in its sole discretion. You are responsible for updating your membership information on myLT.com. Life Time is not responsible for any improper use of LT BUCK$ by individuals on the Primary member’s membership. Participants must be at least 13 years of age and must be a U.S. or Canadian resident. Participation in the Program is void in any jurisdiction where it is prohibited by law or if any special permit or approval is required. The laws of Minnesota apply to the Program without regard to any choice of law or conflict of law rules. EXCEPT IN JURISDICTIONS WHERE SUCH PROVISIONS ARE RESTRICTED, I EXPRESSLY UNDERSTAND AND AGREE THAT IN NO EVENT SHALL LIFE TIME AND ITS SUBSIDIARIES, AFFILIATES, OFFICERS, EMPLOYEES, AGENTS, PARTNERS AND LICENSORS BE LIABLE TO ME OR ANY THIRD PERSON FOR ANY INDIRECT, CONSEQUENTIAL, EXEMPLARY, INCIDENTAL, SPECIAL OR PUNITIVE DAMAGES INCLUDING, BUT NOT LIMITED TO, DAMAGES FOR LOSS OF PROFITS, GOODWILL, USE, DATA OR OTHER INTANGIBLE LOSSES RESULTING FROM THE AWARDING OR REDEMPTION OF LT BUCK$ OR THE LT BUCK$ PROGRAM ITSELF.